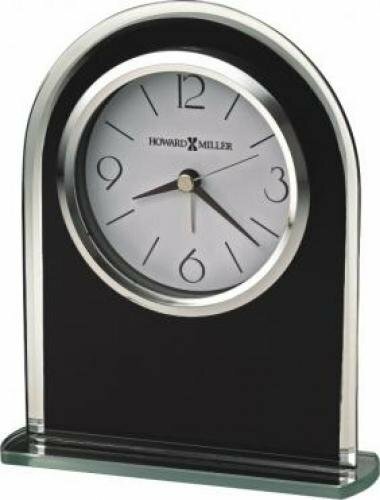 Black glass arched tabletop clock with silver mirrored edge and base. 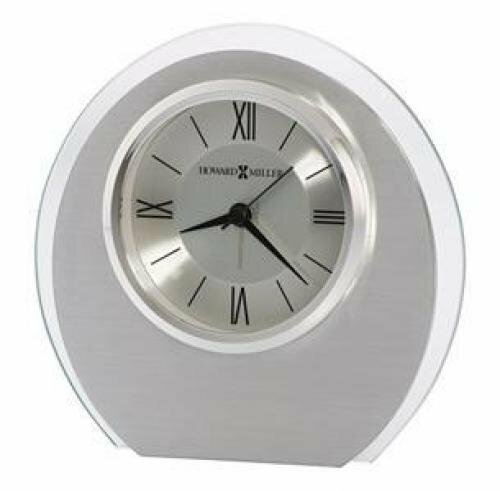 6 1/4" x 5" x 1 1/2"
This elegant oval alarm clock features a brushed aluminum oval over a glass panel. The dial features a satin silver center, a brushed silver outer ring, a polished silver-tone bezel, and black Roman numerals and hands. 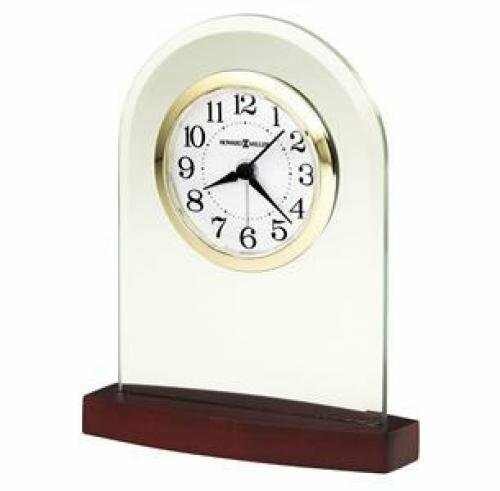 The clock is held upright by an attached support for table or desktop display. 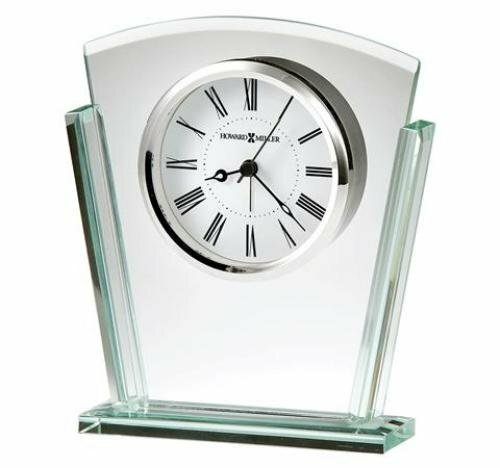 5 1/2" x 5 3/4" x 1 3/4"
This striking optical crystal table clock features a round crystal clear case that sits on top of a black crystal base. The floating dial highlights a polished silver-finished skeleton movement visible in the center. The dial features a circular brushed silver-finished numeral ring with black Roman numerals; black hour and minute hands; and a glass crystal. This clock comes packed in an elegant black presentation box. Visible skeleton movement is operational. 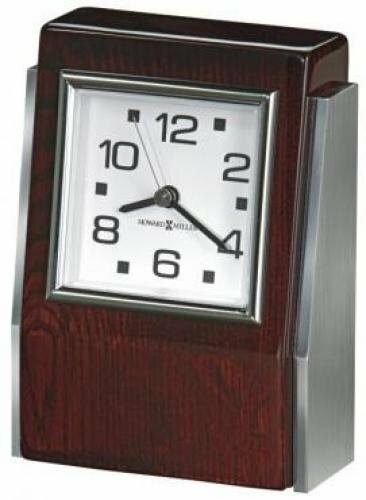 5 3/4" x 4" x 2 1/4"
This mantel clock features brushed aluminum corners and polished silver-tone accents which complement the ebony finished top and base. 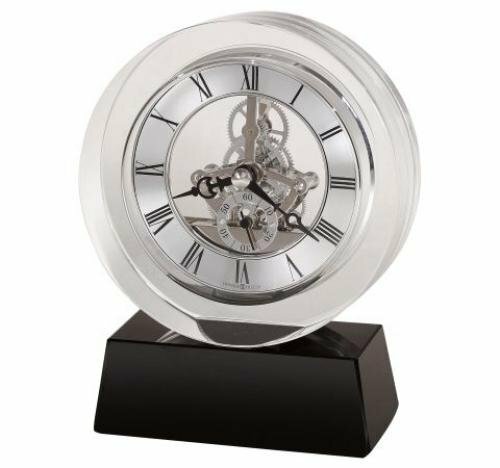 Brushed aluminum dial features an applied circular, brushed aluminum numeral ring with black Roman numerals and hour markers; satin silver center; and glass crystal. A unique, revolving pendulum is located under the dial and finished in a polished silver-tone. Quartz, battery-operated movement plays Westminster chimes on the hour and features volume control. 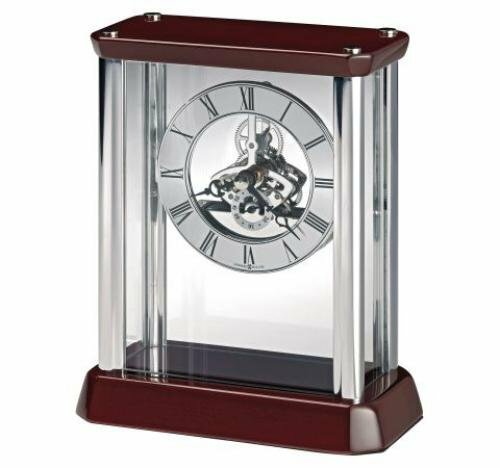 11 3/4" x 8 3/4" x 5 3/4"
The contemporary flare design of this jade glass tabletop clock features a curved top, tapered sides, and beveled base, side and center panels. A crisp white dial is suspended within the glass and displays a contemporary Roman numeral dial; black hour, minute and second hands; a silver alarm hand; and a glass crystal surrounded by a striking polished silver-tone bezel. 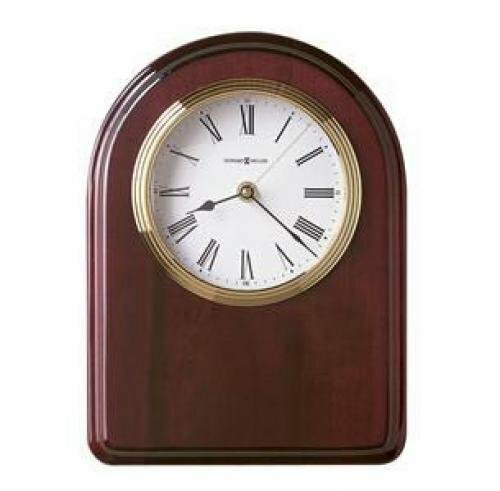 6 3/4" x 5 3/4" x 1 1/2"
Tabletop high gloss rosewood clock with beveled face. The white dial features a polished, silvertone bezel. 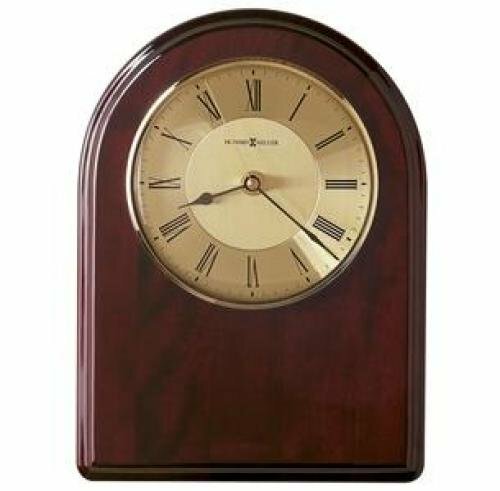 5 3/4" x 4 1/2" x 2"
A white dial is suspended within the arched, beveled glass of this tabletop clock, which sits on a curved, satin Rosewood finished base. The white dial features black Arabic numerals and tic marks, a polished brass-tone bezel, and a shatter-resistant convex crystal. 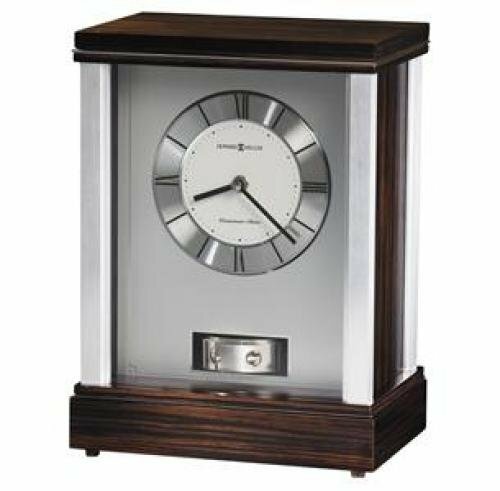 Stylish high-gloss Rosewood Hall finished carriage clock with contemporary polished silver-tone metal corner columns and top cap. The polished silver-tone skeleton movement dial with working gears is suspended in a clear acrylic panel and encased by glass front and side panels and appears to “float” within the case. The dial features a circular silver-tone numeral ring with classic black Roman numerals and hands; a separate seconds track with black Arabic numerals; and a glass crystal. Felt bottom helps protect your table or desktop. Visible skeleton movement is operational. Large arch board with high gloss Rosewood with profiled edge. Brushed, brass-finish dial features a circular, diamond-cut numeral ring and brass tone bezel with a convex glass crystal. 13 1/2" x 10" x 1 3/4"
Arch board with high gloss Rosewood Hall finish with profiled edge. White dial with a brass-finish waterfall style bezel and a convex glass crystal. 11 1/2" x 8 1/2" x 1 3/4"